To schedule a new event for a job or candidate, check the appropriate box in the Jobs or Candidates list and then click the Schedule Event button on the right side menu. This opens up the Schedule Event form. Job(s): This label lists the job(s) that the event has been created for. Template: You may choose a Template and it will auto-populate the form below. If this option does not appear, it means that there are no templates in your Library with Type set to Event and Object set to Job. See Library for more information. Event Notes: A message or notes to assist the user(s) assigned to the event. These notes will appear in the email notification to the user and on the View Event screen. Event Location: The location of the event, which will be included with the calendar appointment sent to the user(s) assigned to the event. Event Date: The date of the event. Assigned To: The user(s) who will be scheduled for this event and their time slot on the event date. You can use the Add Row command to assign multiple users to the event at once. The time slot is entered in the second field and should be entered with both start and end times, e.g. 1pm - 2pm. Send Email Reminder: You can select a frequency to send email reminders to complete the event, or choose Never to not send email reminders for this event. Note that these are reminders sent AFTER the event to remind users to complete the event by submitting feedback. For example, if you select "Every 3 Days" then users will get a reminder 3 days after the event date if they have not yet submitted feedback, and every 3 days until they submit feedback. Candidates: The name of the candidate(s) that the event is being scheduled. Template: You may choose a Template and it will auto-populate the form below. If this option does not appear, it means that there are no templates in your Library with Type set to Event and Object set to Candidate. See Library for more information. Assign Questionnaire: You can select a questionnaire to be attached to the event that will need to be completed by the assigned users to complete the event. Once you click Save, ApplicantStack will send an email to each assigned user which contains the event details, a calendar appointment (to add the event to their calendar) and a link to submit feedback on the event. Event email notifications will include an Add to Calendar link which when clicked will add the event to the user's calendar. When you create an event, you can select a frequency to send automatic email reminders to the assigned user(s) until they complete the event and submit feedback. For example, if you select to send email reminders "Every 3 days", on the third day after the user receives the event notification they will receive an automatic reminder until the event is complete. You can also send a manual email reminder to a user assigned to an event by clicking the View Emails command for an event. This command takes you to the Emails page for the event showing all emails to the assigned user for this event. At the bottom of the page you can send a reminder or follow-up email to the assigned user. You can edit the date or time for an event by clicking the Edit command for the event. If you change the event date or time, ApplicantStack™ will send you can edit the date or time for an event by clicking the Edit command for the event. If you change the event date or time, ApplicantStack™ will send the assigned user an email notification of the new event time. The email will include an updated appointment to add to the user’s calendar. Users assigned to an event can view the event details in a variety of ways. Events will appear on the Events tab of the associated job or candidate, as well as under the Events main tab. Users will also see notifications of upcoming events on their Home tab when they login to ApplicantStack. Once a user completes an event by providing feedback, it will be removed from their notification section on the Home tab. Users assigned to an event can view the event details by clicking the link in the email notification they receive (no login required) or by clicking on the Events Tab in ApplicantStack™ after they have logged in. 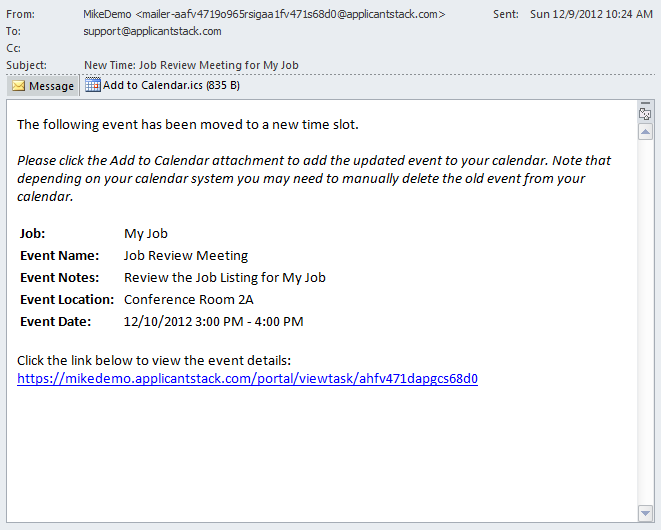 The View Event page for a job and candidate contains the event time and location as well as a link to add the event to the user's calendar. To complete an event, the assigned user fills out the Event Feedback section and clicks Submit Feedback. Users are required to provide feedback comments when they submit feedback. If any questionnaires are attached to the event, the assigned user will be required to complete the attached questionnaire. When a user completes an event an email notification is sent back to the person who created the event letting them know that the event has been completed. Events are easily managed in ApplicantStack™ under the Events Tab. "Expand Filters" at the top of the page can be used to filter the events page. For example, you can filter to see just the events that are Not Complete, or all events for a particular job. On the Events main tab, Administrators and Recruiters will be able to view all events in the system, but Hiring Managers will only be able to view events to which they are assigned. Name: Name of the event. Clicking this will take you to a detail page for that event. Job: The job that the event is associated with. Clicking this will take you to that job’s summary page. Candidate: If an event has been created for a specific candidate, that candidate’s name will appear here. Clicking the candidate’s name will display that candidate’s summary page. Assigned To: The person that the event is assigned. Event Date: This column displays the date and time that the event is to take place. Status: Indicates whether the event has been completed or is incomplete. Created: Displays the date the event was created. Completed: Displays the date that the event was completed. View Details: Go to the Event page and view the details of the selected Event as well as submit feedback for, edit, delete or print the Event. Edit: Clicking this will allow you to edit the event. View Emails: Allows you to view the emails/notifications that have been sent and received about the selected event. You can also send emails to the event creator or assigned user(s). Delete: You can delete the event.